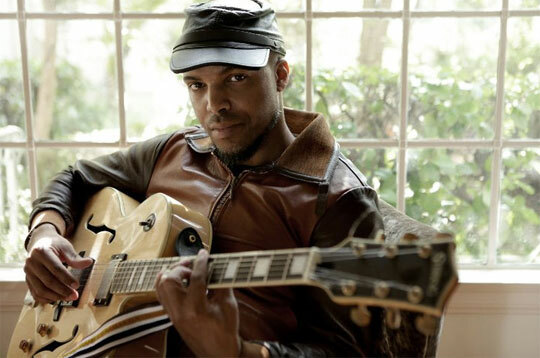 I was introduced to the soulful vocals of, then R&B newcomer, Van Hunt the Winter after my college graduation. Working at a clothing retailer, I was constantly subjected to the same music day after day, thanks to MUZAK so I often found myself talking about music that wasn't playing over the speakers with my co-workers and managers. My manager at the time was obsessed with Van Hunt, so I had to check out what he was all about. I was instantly attracted to his cool, smooth vibe, not to mention his handsome good looks. While it's been a while since I've listened to Van Hunt, it's good to hear that he's back and ready for his comeback. I certainly am! "'June' was written to mirror a person's complicated moodiness," Hunt says. "Some people are called pessimists because of their persistent dourness - but I think they are optimists. Sorely disappointed optimists. The song is my attempt to make one, in particular, smile." To build up anticipation for the new album, Hunt will unveil a series of new tracks each month leading up to the album's Fall release, offering fans free downloads on various music blogs and websites. The album's first single, "elP" will impact multi-format radio outlets later this summer. Van Hunt also plans to take his show on the road later this summer and into fall, marking his first national tour since 2008. Van Hunt released his self-titled debut album in 2004 through Capitol Records. The album included the singles "Down Here In Hell (With You)," "Seconds of Pleasure" and "Dust," the latter of which was nominated for a Grammy Award for 'Best Urban/Alternative Performance.' Chart-wise, Van Hunt reached #38 on the Billboard R&B Albums chart and #14 on the Top Heatseekers chart. Hunt's sophomore release, On The Jungle Floor was released in 2006 featuring the single "Character," as well as a duet with soul singer Nikka Costa ("Mean Sleep") and a cover of a song by The Stooges ("No Sense of Crime"). Hunt toured with the new album, playing with Mary J. Blige, Alicia Keys, The Roots, Seal, Angie Stone, Coldplay, Kanye West and others. 2007 saw Hunt win his first Grammy Award, this time for 'Best R&B Performance by a Duo or Group with Vocals' alongside Joss Stone and John Legend for their cover of Sly & The Family Stone's "Family Affair," recorded for a 2006 tribute album. In 2007 Hunt released an EP via Blue Note Records and had plans to release a full length album in early 2008. Unfortunately, that album never to be since Blue Note had taken over Hunt's recording contract as a result of a little corporate re-shuffling over at Capitol/EMI. Hunt subsequently left his label and the album was shelved. With a new single, album and tour in the works, it would seem that Van Hunt is back and ready to take the stage yet again. From the sounds of it, he's still got what it takes. Go download "June" for free HERE and look out for his official first single later this summer. Why I've been sitting on this one for as long as I have, might very well be the question of the century. Formed in 2009, Graffiti6 is an English pop/rock duo, consisting of singer/songwriter Jamie Scott (D-Side, JLS, Enrique Iglesias) & songwriter/producer TommyD (Jay-Z, Kylie Minogue, KT Tunstall). The duo just recently signed a U.S. record deal with Capitol Records and will be touring this summer in support of their forthcoming debut album. EXCITING! Graffiti6 released an EP on iTunes June 28th for their single, "Annie You Save Me," which features the title track plus a remix of the title track and two acoustic songs, including a cover of Blackstreet's hip-hop classic "No Diggity." "Annie You Save Me" is the band's official first single taken from their debut album, Colours, due out later this year on Capitol Records. The album sounds like an eclectic mix of sounds, at least according to the press release, which calls Graffiti6's music a "genre-defying blend of pop, psychedlia, R&B and British Northern Soul that fully capitalizes on the soaring uplift of Jamie Scott's emotionally transparent voice and gift for melody and TommyD's irresistible rhythms and inventive production." PHEW. I'm exhausted just thinking about this...in a good way of course. The band's already received tons of praise from the UK press, including London's Guardian, who called their songs "latter-day psych-soul nuggets, all phased vocals and sunshine melodies given the warp factor.". Here in the States, Graffiti6 has received praise in the form of prominent TV placements on popular American series, including Grey's Anatomy, Covert Affairs, CSN:NY, One Tree Hill and in the new MTV series Teen Wolf. Not only has MTV featured the band in it's hot new show, but the music network also tauted Graffiti6 as 'ones to watch', featuring the band in it's Freshmen 5, Artists to Watch and Push campaigns. The two London-born "multi-instrumentalists" came together in 2009 and started making music, ultimately coming up with the name "Graffiti6." While musically, the duo is a duo, Graffiti6 wouldn't be Graffiti6 without the mad talents of British artist and illustrator Jimi Crayon, who is responsible for all of the band's artwork, logos and visuals. Now, Graffiti6 isn't the first I've heard of Jamie Scott. I've been crushin' on this British soul hottie since his days as a solo artist signed to Sony Music. His debut single, "Just" peaked at #29 on the UK Singles charts, followed by "Searching" in 2005, which only managed to reach #32. While an album, Soul Searching, was to be released in 2005, it never materialized, due in part to the poor chart performances of both singles and the merger between Sony and BMG. U.S. audiences might recognize Scott for his 2006 soundtrack contribution to the urban dance flick, Step Up, which prominently featured his song "Made" (Scott also played a bit part in the movie). In 2007, Scott released an album with his band, called Jamie Scott & The Town. The album featured the single "When Will I See Your Face Again," which peaked at #41 on the UK Singles Chart. A second single, "Standing In The Rain," was released in January of 2008,featuring a bunch of pop covers including Lily Allen's "Smile," Leona Lewis' "Bleeding Love" and The Zutons' "Valerie," more famously performed by Mark Ronson and Amy Winehouse on Ronson's 2007 album Version. While I'm not sure what the current status is with Jamie Scott & The Town, it seems that Graffiti6 is Scott's newest passion project at the moment, and I for one, am thrilled about it! 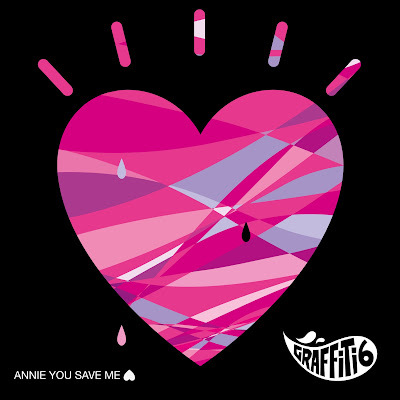 To help celebrate the release of the "Annie You Save Me" EP, Graffiti6 has made a special remix available as a free download. Remixed by DR. ROSEN, the track can be downloaded for free on Graffiti6's official band website. Fans can also download "Stone In My Heart" on U.S. iTunes and vinyl collectors can snag a special 12" vinyl version of "Annie You Save Me" on July 27th, featuring the DR. ROSEN remix and a remix by Lars Stalfors. Check out the duo on tour this summer, tour dates below. You should also check out the music videos for "Annie You Save Me," the incredibly catchy "Stare Into The Sun" and the lyric video for "Stone In My Heart," all below. While you're at it, check out this interesting cover the band did of Adele's #1 international smash hit "Rolling In The Deep." The "Annie You Save Me" EP is on U.S. iTunes HERE. Download it!